Professor Len Collard was the main investigator in charge of the project working at ARF-I on a full-time basis. Other staff included a Research Associate on a part-time (0.2) basis and Masters student. Len Collard is a Nyungar from the Aborigines of the South-West, Western Australia. Len’s formal research, employment, education, training and practical work have been predominantly with the Nyungar community. Len has had considerable involvement with academic research, Aboriginal community organisations and federal, state and local government agencies. 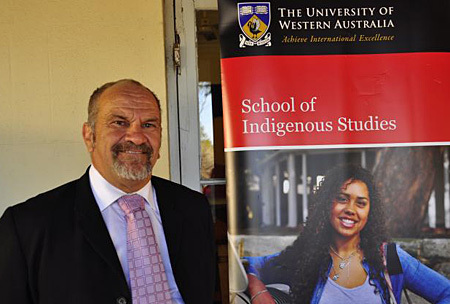 He has been able to formulate, implement, monitor and financially control a broad range of research projects and curriculum programs aimed at Nyungar and Australian society. Len’s work has enabled him to better tailor each research project to the unique characteristics of the Nyungar involved. Nyungar research has given Len a broad and in-depth understanding of the many different underlying ethical, social and economic concerns to the Nyungar Aboriginal families of Western Australia. This appreciation was critical to effective research in the proposed project. Len’s role as the ARF-I was responsible for the overall processes and outcomes of the research project. Sandra Harben, Research Associate (RA) is a Whadjuck/Ballardong Nyungar woman. Sandra’s role was to assist the ARF-I in data collection, including access to archival data, academic and government publications. She undertook the preliminary analysis and contributed to the research outcomes from the project. Sandra had a crucial role in the development of the data set that included all of the information relating to the placenames, locations, Nyungar location and other relevant information. Sandra coordinated all activities related to the projects, including networking with the various stakeholders, so her competency in spoken and written Nyungar was essential, as were her sound research and communication skills. Sandra’s qualifications include a Bachelor of Arts degree with a double major in Industrial Relations and Geography and a minor in Anthropology and Australian History from the University of Western Australia, 1994. She was awarded the Aboriginal and Torres Strait Islander Research Scholarship, Murdoch University, 2003 and the National Aboriginal and Torres Strait Islander Overseas Study Award, undertaken at University of Illinois, USA, 1995. Sandra has worked on significant projects relating to Nyungar culture and heritage including an Australian Research Grant project related to Nyungar tourism in the Southwest of Western Australia. She currently manages the Kaartdijin Noongar website at the Southwest Aboriginal Land and Sea Council and has published a number of reports and publications..
Angela Rooney is a Research Associate at the School of Indigenous Studies, University of Western Australia. Her research explores Nyungar language through the investigation of themes of revolving around placename meanings, mapping and connection to country. Born in the South-West, Angela experienced an adventurous outdoor childhood roaming around the local area of Pibelmen. Since that time, she has built a professional work career spanning the UK, France and Singapore. A cartographer by training, she also has a Bachelor of Commerce and Graduate Diploma in Sustainability Studies.